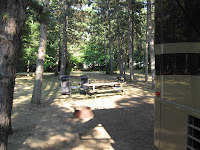 We spent the morning cleaning the motorhome and enjoying the very large space that we have here. The length of the space has to be in the 150 foot range. It is like having a very long backyard. There are many bike paths in the area, no doubt due to the Dutch influence. 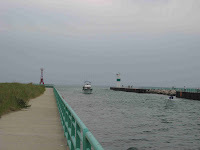 We loaded up the bikes and headed for a park a few miles north of Holland, where we could intercept one of these paths that would take us to the Holland State park and a good view of “Big Red” the historic lighthouse on the opposite side of the entrance channel. 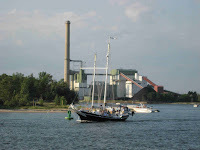 When the Dutch immigrants settled in the area they needed a port for transportation of goods. After waiting for Congress to provide the funding for the port, as they promised, for a lengthy period (sound familiar? ), they decided to handle it and dug the entrance canal themselves. Oh, yes the immigrants also had to build the lighthouse, as well. That shipping channel is still in use today. 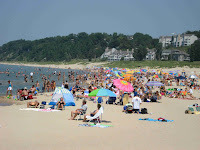 It was a beautiful day by the water and lots of people were enjoying the beach and the water. It was amusing to watch the young girls in their small bikini’s heading out onto the pier followed by a long line of boys intent on impressing them in any way possible, including diving off the pier head first into the boulder packed water. I guess some things just never change. We then peddled back to the park for a lunch under the trees. It was only a seven mile round trip but that was enough, in the near 90 degree temperature. 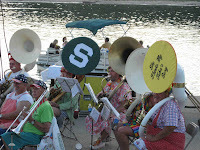 After having a dinner prepared on the grill in our “back yard” we headed off to Grand Haven to a concert by the Scottville Clown Band. 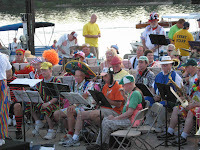 They have been playing at the Coast Guard festival for 60 years. They dress funny and fool around a lot but have a good sound and great uplifting music. Some of the members have been with the band for as long as 50 years. I particularly enjoyed the piccolo solo during the Sousa songs. He was a young 85. 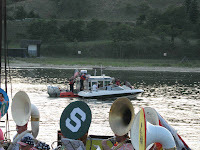 I have to note that the USCG did its usual good PR during the performance by doing a vessel safety check right in front of the band during the show. 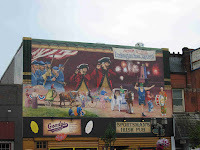 Today, we headed to Holland Michigan to visit the Dutch Village, which is a small park designed to give the unfamiliar a feel for what life in the Netherlands was like a couple of centuries ago. We went for a visit to our past. We took the kids here over 20 years ago in a small rental motorhome that was the beginning of the journey that we are now on. 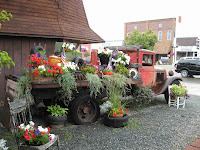 It was not as much fun as being there with the kids, but we enjoyed the trip back in time. It helped that we watched a family video of the last trip the night before. We then went down to the waterfront and found a new restaurant next to a city park along the river. With the great weather, we sat outside and enjoyed the view along with an excellent lunch. Lastly, we tried to decorate the coach with a Coast Guard pendant, to join the fun of the festival. The vote is out still on this idea. 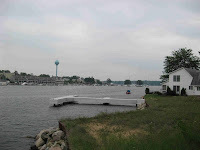 Friday we traveled to River Pines RV Resort, which is close to Coast Guard City USA, otherwise known as Grand Haven, Michigan. 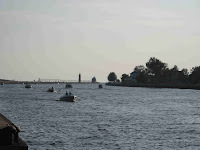 Every year for well over 80 years Grand Haven has been putting on a festival to recognize the US Coast Guard. After 38 years associated with the Coast Guard, it seemed about time to attend one of these festivals. After setting up on Friday, Anneke checked the internet for traditional Dutch stores in the area. 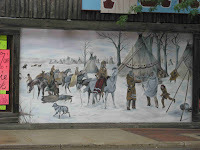 Since this area was largely settled by Dutch immigrants, we found several to choose from. We headed out to one near Grand Rapids and stocked on all our favorite Dutch treats- aged Dutch cheeses, stroop waffles, various cookies and mints. 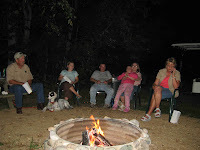 We saw that the campground was having a community campfire and social gathering. This seemed like a great opportunity to have a fire without actually having to get it going. It turned out to be a very enjoyable evening sharing campfire cooking ideas (along with samples) and the travel stories of around 15 our fellow travelers and campground staff. 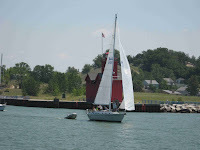 Grand Haven proved to be yet another quaint, well kept lake shore community with a bent towards many festivals to keep the town going. We checked out the locations of the various scheduled events and purchased advance tickets for the entertainment performances that we were sure we wanted to see. The first of these was Saturday evening and was a parrot head style concert by the Son of Beaches band that mostly played Jimmy Buffet tunes. I became a real Buffet fan while working in Miami and it was a great time. 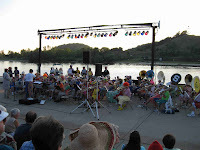 The concert was held along the waterfront in great weather. It addition to the concert, there was a steady stream of boats going back and forth. The evening was capped off by a performance of the Western Michigan fire burners, who thrilled the crowd while performing acrobatics while handling various burning objects. 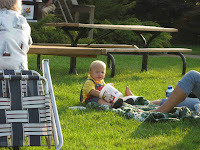 The rain let up Tuesday just in time for us to travel to a small town just east of Ludington (Scottville) for the regular summertime evening concert in the park. 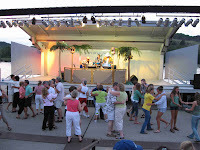 The town government and, local businesses sponsor this event and it attracts a good crowd of nearby residents. This time it was the Salt City Dixie Jazz band. 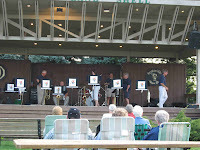 They put on a good show and played a lot of the “big band” era songs. 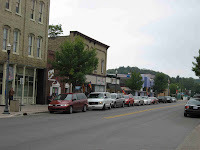 It was a relaxing small town experience. 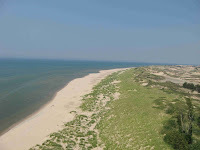 The Dunes State Park is located just north of Ludington and contains miles of beach along the shores of Lake Michigan and, of course, lots of dunes. 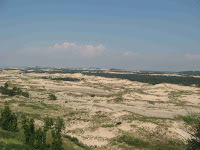 It also has a number of biking and hiking trails. 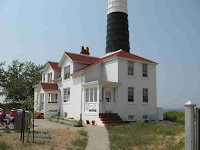 We first biked to the Big Sable Point lighthouse located within the park. 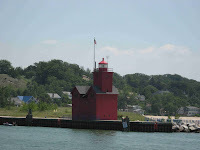 This lighthouse marks the northern end of an area of the western shore of Lake Michigan that is locally known as a “grave yard of ships”. This area reportedly has claimed 47 vessels. 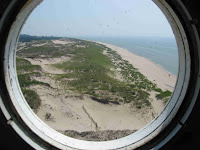 The climb to the top of the lighthouse was hot but the view and breeze once there was worth the effort. 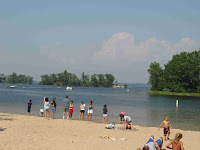 We then biked to the other end of the park that had a beach on a bay off the lake with included islands and numerous places for boats to enjoy the park. 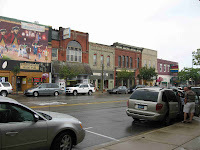 Today we visited Pentwater, Mi, which is a small town just south of Ludington. 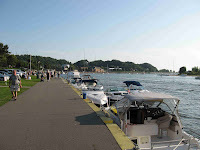 It is also located on the lake. 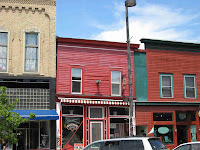 It had the surprising feel of a little bit of Key West with the outdoor eating places and festive atmosphere and the waterfront towns in New England with the neat little houses along town streets and the fresh air of the nearby water with marinas and boats hanging on mooring buoys. They also had a great kite and flag store, where we added a flag and stunt kite to the motorhome inventory. 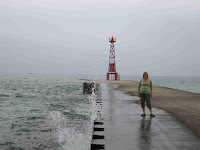 Today we traveled to Ludington, Mi for a short stay to enjoy the shore and delights of the area. 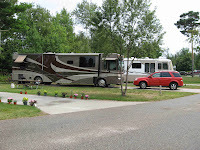 We settled into the Vacation Station, which is hoping to create a camper condo park. 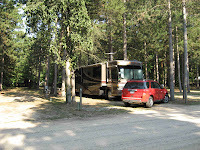 This is a campground where folks buy their spots and the management team can rent them out while they are not using them, if they prefer. It seems to be a well maintained place, but I have serious doubts that it is going to be a big success. It does look like it will do fine as a good old fashioned RV resort. 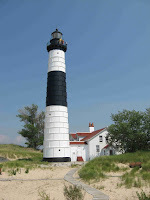 After setting up, we took a tour of the area, visiting the downtown area of Ludington, Dunes State Park, and the Lighthouse at the entrance to the port. On the way to Ludington, we passed thru a very small town and Anneke insisted that we stop and get her picture with the sign. Anneke read in her book-Road Food-about a local fish store, where you can enjoy their deep fried products right on site via the provided picnic tables. It was quite a way out of town and the GPS was helpful in finding the place. We purchased some fresh Lake Trout and some smoked Norwegian Salmon. The trout was grilled for a great first day meal at the motorhome. Finally, we made a trip to one of those famous stores to replace the digital camera that I so carelessly destroyed on the canoe trip. Heather and Katie got a chance to rush up to Georgia to see their new nephew. A picture of this momentous event is included.